A growing distribution firm is building a new £3 million headquarters and warehouse which will more than double its capacity and create 12 new jobs. 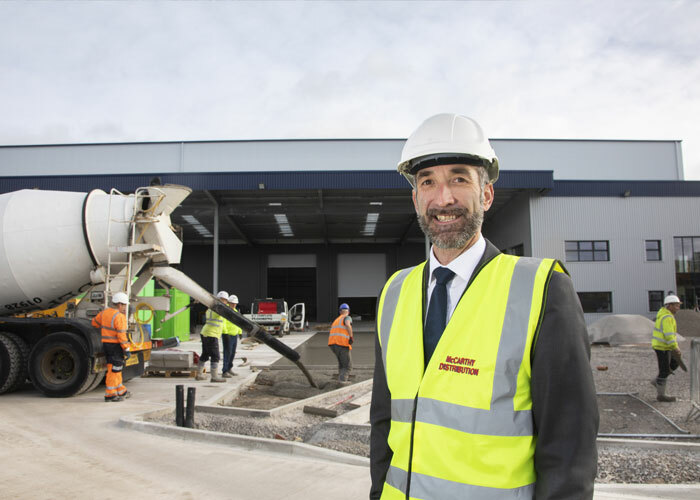 Mike McCarthy, Managing Director of McCarthy Distribution, based on Wrexham Industrial Estate, has launched the ambitious expansion plan to cater for the increasing demand for warehouse space from firms moving their products around the UK and importing goods from overseas. The large building, set on a four-and-a-half-acre plot just across the road from their existing offices, is 21 metres high and will house 10,000 pallet spaces to cater for dozens of daily shipments for companies throughout the UK and abroad. It is thought to be one of the tallest warehouses in North Wales. When the building is completed next month (November) there will be 42,000 square feet of warehouse space and an additional 15,000 square foot canopy area outside where vehicles will load and unload. There will also be 6,500 square feet given over to the firm’s administrative teams including their customer service, finance, HR and quality control departments. An additional £500,000 will be spent on forklift trucks and racking in the new warehouse ready to handle the heavily increased amount of palletized freight. The haulage, storage and distribution firm was set up in its current guise 25 years ago. The firm now has 75 people on the payroll and a 30-strong fleet of vehicles. “We were full to capacity and we did not want to turn away warehousing enquiries because we did not have the space. “For a number of years there has been a shortage of purpose-built warehousing and growing demand for warehouse space. “The prospect of extra capacity has already helped us attract new clients because warehouse expansion will give us the capacity to fulfill their needs. Building the new complex was made possible by financial support from Clydesdale & Yorkshire Bank Group and it is being built by Portal Construction (NW) Ltd.
Like McCarthy Distribution’s existing warehouse facilities, the new site will be accredited by the British Retail Consortium (BRC) which means it has passed stringent inspections to be allowed to handle food products and packaging. Moving to the new premises will also enable the company to bring the entire team together under one roof. “We currently operate from two sites with the admin and distribution team based in the building we own and the warehouse team operating from premises nearby. “As well as more than doubling our warehouse capacity, having the whole of the McCarthy Group team together in one building will improve our operational efficiency. “Owning our entire site is also a great asset for the company and helps to secure the long-term future of the firm and the jobs of everybody working for us. “We already warehouse and distribute freight for brand-leading, multi-national producers and we are confident the new state-of-the-art facility will help us cater for the increasing demand for high quality warehousing and distribution for businesses. “Another key factor is that we are based on Wrexham Industrial Estate which is an ideal location because we are so well connected to the motorway network here. It’s also within easy reach of the Port of Liverpool. McCarthy Distribution is a partner of two palletized delivery networks called Pallet Track and PartnerLink which is a partnership of professional and reputable haulage firms around the UK who come together to support businesses big and small who have freight which need to be moved around the country.